Payton admires the magical fish while Papa admires magical Payton. One aspect of our routine when Payton comes is a visit to WalMart where Honey shops for routine odds and ends, but each time Payton insists (successfully, of course) on a trip to the pet department where she spends time admiring the fish for sale in the aquariums. Usually, I’m stuck at work while Honey and Payton go off together, and all I get are reports of these adventures. But on the occasion chronicled here during the summer past, Papa was at the scene with his iPhone and snapped this darling photo. 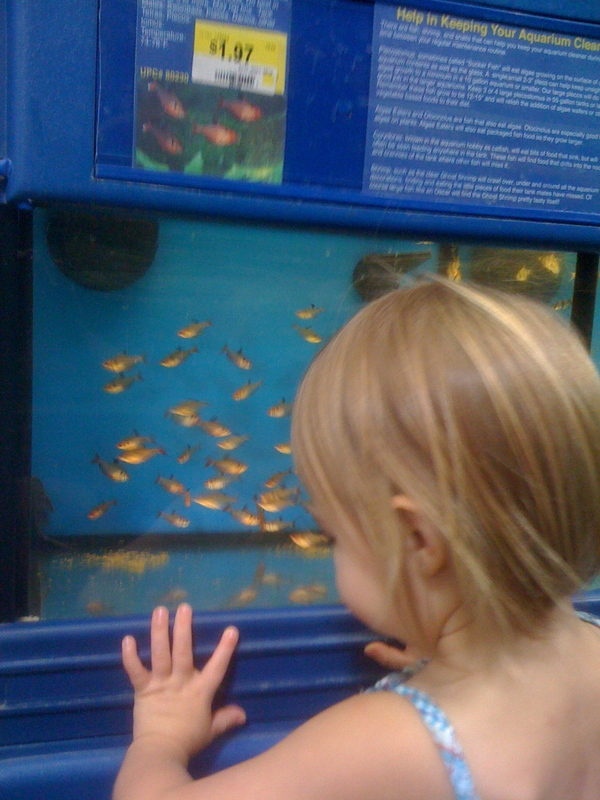 To a little girl, tropical fish are magical. But so to Papa, his little granddaughter is just as magical! Those of us in higher education in Louisiana got the news yesterday that we were expecting for a few weeks: Another $100+ mid-year budget cut, most of which lands on the backs of higher education and health and hospital services. The governor’s chicken-hearted announcement came late on a Friday afternoon, timed conveniently, I’m sure, so that offices would close and everyone would go home for the weekend, allowing the governor to to dodge the media until after the weekend. Ah, leadership: At least he knows the word? But does he know how? 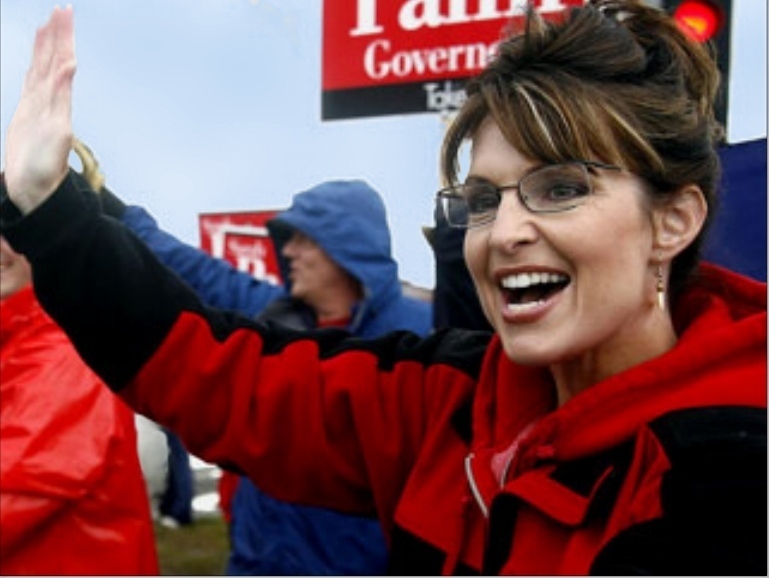 The answer is painfully obvious by now: “No, Jindal doesn’t have a clue” [how to lead the state]. And I’m pretty darned offended that he’d make a remark now, insinuating that others’ leadership has failed Louisiana when his own has failed so abjectly. his own beyond-Louisiana ambitions–that he’s the salvation of our State. 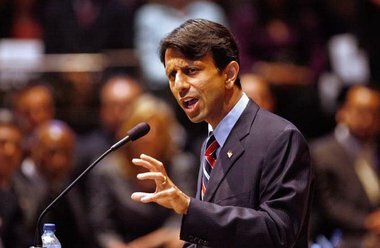 country sees what’s going on in Louisiana on Bobby Jindal’s watch–They’ll see what a loser this guy is before he gets a chance to toss his sweet-scented bouquets of populism as he seeks to dupe a national audience. I’m a little mystified at the Fall Break occurring today and tomorrow at LSU System campuses: The two-day hiatus from classes applies only to students and faculty. Administrators (like me, even though I teach, also) and classified staff report to work as usual: No rest for the weary. What’s wrong with administrators and classified university employees? Do we not work as hard as students and faculty? Are our efforts valued less than faculty? Is our status lowly in comparison? Oh, well. I know what I’ll do: I’ll declare annual leave and take Friday off anyway. I need a break: I earned it, so I’m taking it. I’ll see you Friday at the Mall of Louisiana with my wife and daughter. This picture is from last year. The turf''s condition, resulting from the autumnal canine excavations, is the same again this year. 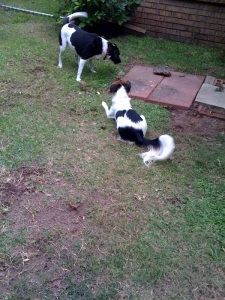 tantalizes our doggies to dig so much this season of the year? An enlightened veterinary explanation would be appreciated. Sarah and I sat on the patio [last year on an] afternoon, lamenting the ugly patch of lawn adjacent to the patio where Marley the Dog has destroyed the yard, scratching and rooting for God-knows-what. All we [knew] is that our stretch of healthy, green grass [had] been clawed and plowed and scraped bare right before the onset of winter, assuring a winter’s worth of mud to dirty the doggie pattes (paws) all the more as they track up the patio (and into the house!). Why he digs is beyond us. He’s almost two [three now], so the propensity doesn’t owe to puppyhood. And we’re pretty sure there’s no buried treasure. 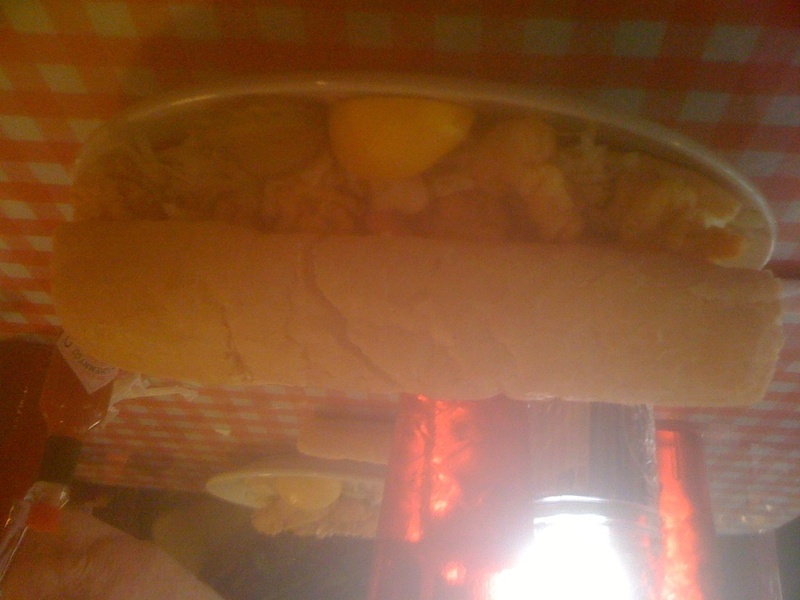 Schwing's makes a mean shrimp po' boy! Sarah and I went to Covington today to aid and abet the parents’ move scheduled for tomorrow. Amid the hard work of packing and yard cleaning, the treat of the day was lunch at Schwing’s on W. 21st St. (Hwy. 190 W Business). Though disappointed that oysters were not available (thanks indirectly to BP), we found solace in the shrimp and catfish alternatives. The po’boys were large enough to appease a deck hand’s appetite, and everything from the bread to the fried seafood to the Tabasco was done just right. Louisiana seafood rocks–I eat it every chance I get to prove to the skeptical world that Gulf seafood is as good as ever, BP’s debacle notwithstanding. I”m taking a break from watching CNN’s live coverage of the Chilean mine rescue–The rescue capsule just started on the way up with the first of the miners on his way to deliverance. The images I’ve seen the past half hour are remarkable, stunning. By the time I finished this post, the first miner arrived at the surface. As Florencio hugged and kissed his family, I had to lift my hands in praise to the God of deliverance. Yes, a theological solution. I can’t account for all the evil that goes on in this life, but why dwell on the negative? In this drama, man has occasion to consider on which side the bread of life is buttered. 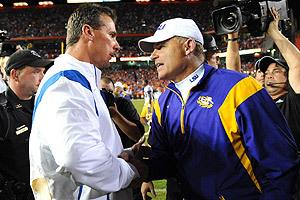 The winning coach greets the loser: "Geaux, LSU!" win in “the Swamp” Saturday night at Florida, it’s time to call the dogs off. The LSU win at Florida was masterful. Many Tiger fans found the dogfight win frustrating and expressed dissatisfaction because the game was so hard-fought and the victory so tenuous, but I say, “Hey, that’s life in the SEC: Winning’s tough!” That’s why the SEC is the top conference in the land. So let’s back off for a while from our criticism of Miles. Florida’s Urban Myers–a good coach indeed–was clearly outcoached just as the Gators were outplayed. Les rose to the challenge of the occasion: So let’s rally around the base, Tiger fans, just like the Tigers rose against Florida to vindicate their coach! Soft-shelled crabs are a Gulf Coast delicacy, unquestionably. I recall crabbing expeditions as a youngster: When Daddy came across a rare soft-shelled crab and fished it out of the canal with his dip net, his glee could not have been surpassed had he f ound a $20 bill tangled in the grassy seaweed that concealed the moulting crab. Lots of folks from other parts of the country may find the photo of the fried soft-shelled crab appalling with the legs dangling from the bun. If the squeamish are consolable at all, I can assure them that the objectionable innards of the crab are removed before committing the breaded carcass to the grease. 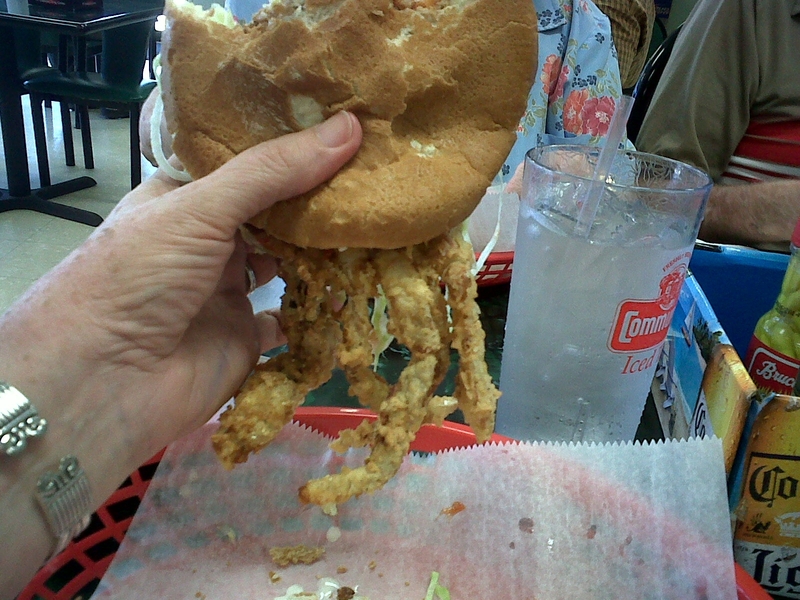 Nonetheless, the graphic reality the photo depicts is prepared soft shelled crab, a Louisiana style delicacy: The fried crab intact gets slapped between the buns, dressed typically with mayonnaise and/or ketchup, lettuce, tomato, pickle, and perhaps a dash or two of Tabasco. Thanks to my sister, who thoughtfully took this picture while there was enough crab sandwich left to photograph. A few more savory bites and I’d have to discover another topic for today’s post. From Bobcat Stadium to WalMart, Acadiana Friday night "en grand Eunice." On Friday nights in the fall, just a few blocks south of US 190 on the west end of Eunice, Louisiana, the sons and daughters of EHS convene at Bobcat Field for their weekly fix of high school football. The whole community supports the Bobcat team that bears the town’s name and banner. This Friday night was Homecoming. 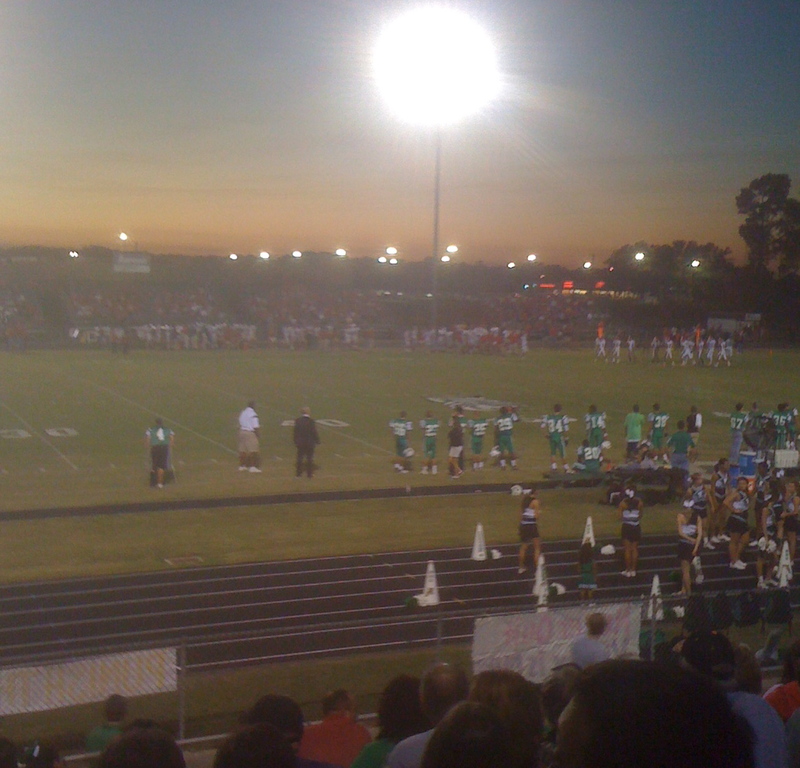 The view of the field from the home stands looking west across Bobcat Field provides a vintage glimpse of small town Americana: The home town fans rooting for the Bobcats in the foreground, the players on the field, the visiting team with their fans arrayed on the opposite sideline, a 40 acre or so strip of cultivated rice right behind the visitors’ bleachers, and then at the western edge of the rice field, the local WalMart lit up with shimmering lights on the parking lot and adjoining strip mall. Long live the U.S.A., and long live small towns in quaint country places. 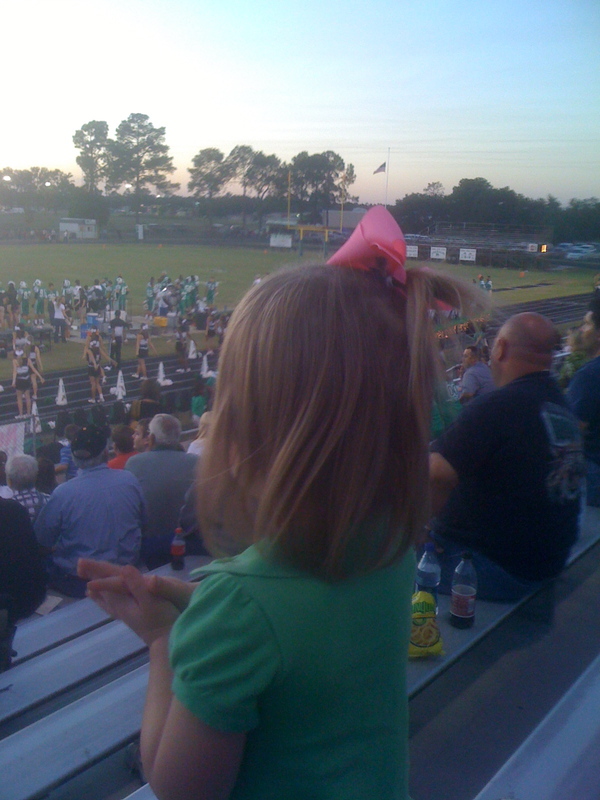 Payton "Elizabuff" studies the action. Watching the granddaughter is more amusing than watching the game.